What is now Cavite City was once a mooring place for Chinese junks trading that came to trade with the settlements around Manila Bay. In 1571, Spanish colonizers founded the port and city of Cavite and fortified the settlement as a first line of defense for the city of Manila. Galleons were built and fitted at the port and many Chinese merchants settled in the communities of Bacoor and Kawit, opposite the Spanish city to trade silks, porcelain and other Oriental goods. The vibrant mix of traders, Spanish seamen and local residents gave rise to the use of pidgin Spanish called chabacano. In 1614, the politico-military jurisdiction of Cavite was established covering all the present territory except for the town of Maragondon, which used to belong to the corregimiento of Mariveles. Maragondon was ceded to Cavite in 1754. 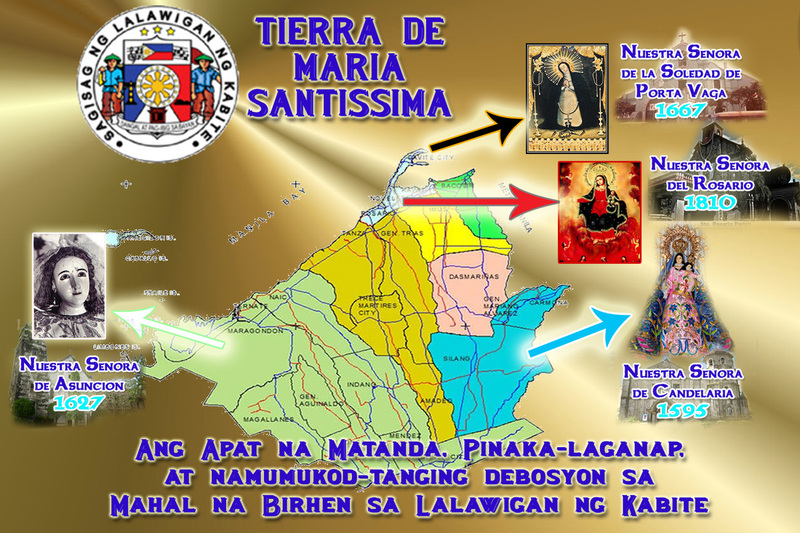 Within Maragondon was a settlement established in 1663 for Christian exiles from Ternate, Mollucas. Owing to its military importance, Cavite was attacked by foreigners in their quest to conquer Manila and the Philippines. The Dutch made a surprise attack on the city in 1647, founding the port incessantly, but were repulsed. In 1672, the British occupied the port during their two-year interregnum in the Philippines. American forces attacked the Spanish squadron in Cavite. The Spanish defeat marked the end of Spanish rule in the country. Missionary orders acquired and enlarged vast haciendas in Cavite during the 18th and 19th century. These haciendas became the source of bitter agrarian conflicts between the friar orders and Filipino farmers and pushed a number of Cavitenos to live as outlaws. This opposition to the friar orders was an important factor that drove many Cavite residents to support reform, and later, independence. In 1872, a mutiny by disgruntled navy men in Cavite led to a large-scale crackdown on reformers and liberals. Three Filipino priests – Jose Burgos, Mariano Gomez and Jacinto Zamora- were executed and dozens others sent into exile. In 1896, after the outbreak of the Philippine Revolution, Cavite took center stage as thousands of Katipuneros liberated most of the province's towns. On August 26, 1896, when the Philippine revolution against Spain broke out, Cavite became a bloody theatre war. Led by Emilio Aguinaldo, Cavitenos made surprise attacks on the Spanish headquarters and soon liberated the whole province. Emilio Aguinaldo, the first Philippine president came from the town of Kawit and directed the conduct of the Revolution from his base in the province. He agreed to go into exile in December 1897, but returned to the Philippines in May 1898. On June 12, he declared Philippine independence from the balcony of his home in Kawit. The Americans established civil government in the province in 1901. The naval station in Sangley Point became the chief American naval base in the country. The Japanese targeted the naval base during the first wave of attacks on military installations in the Philippines. Cavite and its people, what they are today, and what will be tomorrow will remain their infinity, as a place with a glorious history, and a people fortified with strength to live and die for a worthy cause.